Speare Seeds Limited is a Canadian owned forage and turf seed business based in Harriston, ON, Canada. We take pride in our Canadian heritage and our 40 year history of serving customers across Canada. Speare Seeds Limited is committed to providing quality products to our customers and we aim to deliver solutions that surpass our customers’ needs. We offer an extensive variety of forage and turf seeds which allows us to service the needs of several growing markets. We also offer custom blending to accommodate your individual requirements. Our relationships with producers and suppliers in Canada and around the world enable us to provide products that are increasingly higher in demand. 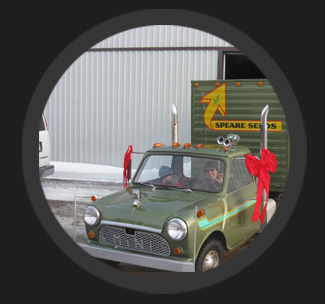 The Speare Seeds Limited mini shown in the picture to the right, was specifically created to participate in parades throughout our community. Children always look forward to seeing it in the parades. We are ‘The Root to Your Success’.